150 years hence, humanity is making its first steps towards colonising an exoplanet thanks to a drive based on the weird new physics of Kernel Technology, a spin off from spacio-temporal anomalies discovered beneath the surface of Mercury. Yuri Eden is one of the unwitting settlers press-ganged into the colonisation of Proxima C and he soon discovers that the foundation of a new world is full of danger, not least from his fellow colonists. Looming climate change is so inevitable that many SF novels are now set after this slow apocalypse. 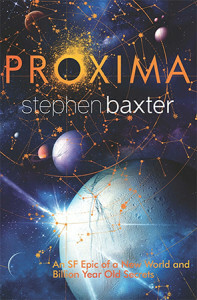 Proxima is one such novel, the “climate jolts” and crimes of the “heroic generation” alluded to as major events in the recent past that have scarred the psyche of the human race. Protagonist Yuri Eden is actually a refugee from these times due to his parents having put him in cryogenic suspension in a bid to escape the chaos and the blame. As such he is an ideal everyman through which the reader can view these new worlds, his fish out of water status allowing other characters to fill him (and the reader) in on background details without it seeming forced. Despite Earth having survived the climate jolts, Proxima paints a grim picture of the near future. The two power blocs – the Framework and the UN – are as ruthless and power hungry as any in history, still pursuing their own ends despite the humbling scale of interstellar travel. Few of the settlers on Proxima C (christened Per Ardua by Yuri’s group) are sympathetic thanks to the colonisation effort being more analogous to the transportation of convicts to Australia than the voyages of any bold pioneers. Aside from Yuri and Kernel scientist Stef Kalinski some of the most compelling characters in the novel are AIs – the ColU (Colonisation Unit – a Swiss-army knife of a machine left behind with Yuri’s group to facilitate their settlement), the mysterious planet-wide Earthshine and the sentient programmable matter space probe Angelia. The disparate plot threads of the novel are woven together in an intelligent manner and are just as absorbing as each other. The trials of the colonisation efforts on Per Ardua and the discovery and description of the alien life there are (literally!) light years from the political machinations and scientific investigation going on in the home solar system, but the stories dovetail in a manner that has a pleasing symmetry to it. 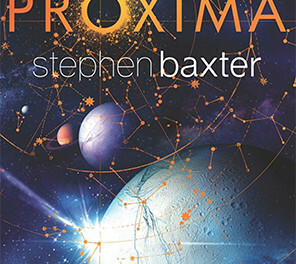 Whilst grounded in the paraphernalia of hard SF, the mystery of the creators of the kernels and associated structures keep the reader guessing right up until the end. Like all good science fiction, Proxima isn’t afraid to tackle big ideas head on but maintains a human perspective throughout. The dramatic events of the last few chapters as well as the unexpected cliffhanger mean that the sequel Ultima, due in 2015, cannot come soon enough.